Long Living Room Layout – Small spaces can be difficult to design, especially if you want to ensure that the area does not look cluttered and it has a spacious feel about it. In this article, we will give you ideas for long living room layouts to make a narrow space look great. In most modern houses there is always a tussle for space. From the bedrooms to the kitchen, and even the living space, you can be at a loss when it comes to ensuring that your house does not look like it is stuffed with furniture and there is absolutely no space to move around. 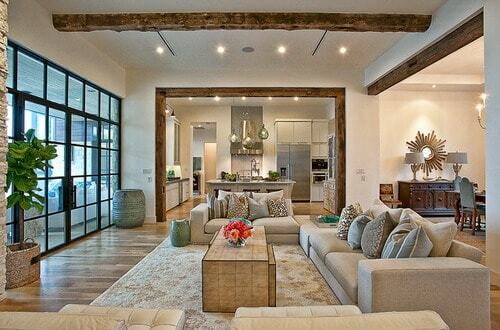 Decorating a narrow yet Long Living Room Layout can be quite a tough task. But, if you plan your layout well in advance, then you can create a space that looks like it should be featured in a design magazine. In this article, we give you some ideas for long living rooms that will help you create the living area of your dreams. Before the actual designing it is important that you make a layout for the room in question. Ensure that you measure the room properly, and then create a scale so as to replicate the proportions on paper. It is important that while planning the living room design, you ensure that the area is balanced and does not seem furniture heavy. Even with a long living area that can seem quite difficult to fill in, you can create a space that will not only be gorgeous but also enviable. A Long Living Room Layout can often pose serious problems while designing the space, but if you know the tips behind proper furniture arrangement, wall colors and choosing the right accessories, you should have a beautiful room in your house. A tip that many interior designers will suggest is to always use a paper or graph layout of the actual room. Use paper cutouts to represent each piece of furniture that you own and then place them on the graph paper to create different decors. Choose a design that is aesthetically pleasing to your eye, uses the space well, and creates a conversation space that can easily seat at least five people. Instead of having one conversation space which can accommodate many people, try and create multiple areas for seating. Make one wall the focal point of the living area by creating a fireplace there or having your television mounted there. One thing that you would definitely want to avoid with a Long Living Room Layout is to ensure that it does not start looking like a hallway. This is why it is important that you create seating area that is not affixed to the walls, but is floating in the middle area. You can also choose to create a reading area beside a window or a fireplace with a comfortable large armchair placed alongside a tiny table with a lamp on it. This could be a great conversation point. Colors and textured walls can go a long way in changing the character of the room and also to give it an illusion of space. 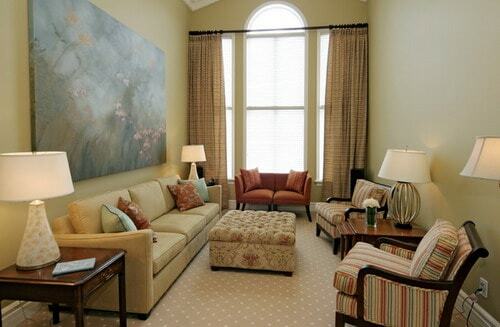 Lighter colors always work well if you want to make the room appear larger as do mirrors. Use a wall color that can highlight the talking point of the room, which could be any accessory that you think is the most attractive piece in the room. While choosing accessories for the room, first think about those things that are utilitarian and which you need in your room. These include the furniture for the room and the lighting in the form of lamps. Choosing lamps will ensure that you have great lighting for each of your reading spaces. Use small tables to create anchors for floating sofas and keep coffee table books on these or even smaller knickknacks. One accessory that works very well in any long living room layout would be a mirror that can create an illusion of space in the room. Using ornate mirrors can also add to the attractiveness of the room in general. These are just some of the tips that you can use if you are looking for ideas for long living room layouts. Use these to create a space that not only you are proud of but also make your guests extremely envious.